Have you noticed how visually awesome TV commercials are nowadays? Marketing companies put a lot of money into making advertisements that visually pop and stick. We’ve grown to expect things to look good. If they don’t, we tune them out. If someone comes to your website and it’s hideous, they’re going to move on to a better looking site. On the other hand, if someone comes to your site and they’re blown away by your design, they’re going to stick around to actually read something. Today I’m going to show you how to grab a design that’ll make your visitors feel at home for as little as FREE. Why it’s Important to have a Good Design? Didn’t your grandmama always tell you that you can’t judge a book by its cover? But you still do it. We can’t help it. When you’re in a store with thousands of books, the cover is the only reason you pick it up and read what’s on the inside. It’s the first thing they see. Before a new visitor will ever read a single word on your website, they’re going to judge your design. That split-second will determine whether or not they stick around and, ultimately, whether or not they buy something from you. It’s the #1 thing they’ll remember. The colors, lines, gradients, drop-shadows and tiny leprechauns all lead to the message that you want to convey. An ugly website sends a negative message. A beautiful website that’s consistent with your brand will subconsciously make your customers love your website and your business. It’ll build credibility which leads to authority. If they can tell that you’ve put some work into your design, they’re going trust that you emphasize quality in everything you do. This is the easiest way to build credibility. Once you have credibility, you’ll develop authority. And nothing is more powerful than being an authority in your niche. Fortunately, getting a good design is a heck of a lot easier and cheaper than it used to be. When a visitor first comes to your website, their eyes start in the upper left and move in an “F” pattern down your page. So you want all of your important content (the stuff that keeps them looking) at the top and on the left. The default WordPress theme is much better than it used to be, but that’s not saying much. You have three options for laying a design on your site. If you have a background in design or simply want to learn the craft, do it yourself. Your design will be 100% original and it’s relatively free. If you want to learn how to do it anyway, spend a few days or weeks to design it yourself. Syed Balkhi has a background in design so he designed WPBeginner himself. He could have spent thousands of dollars to hire someone, but most designers wouldn’t put the level of detail into his design that he would. Whether you want to design your site or not, I highly recommend going through the free HTML and CSS tutorials on w3schools.com. They’ll give you a basic understanding of how to structure and stylize web pages, which will come in handy when you start updating your site. Design – How it looks out-of-the-box. SEO – Coded for search engines and meta data. Custom – Customizable colors, layout and logo. Support – Contactability, documentation, user forums, and community-based support. Price – For the necessities. Score – Out of 100. Upsides: Gorgeous out-of-the-box designs; beautifying your content with shortcodes is simple; easy customization with epanel; 2nd cheapest option at $39 gives you access to all of their themes for one year. Downsides: Complicated to adjust technical components of theme if you’re a designer or programmer. Best for: Beginners without design or programming skills. Upsides: 10+ free themes to choose from, but with limited capability; proven because been in the industry since 2006 (which is a long time); great designs. Downsides: limited customization; widespread so your site will be less unique. Best for: Beginners and if you don’t have a budget. Upsides: Smartly coded and designed for search engines; turn-key designs make it simple to dramatically update the look of your site in a jiff; 20 forum moderators from around the world means instant support any time; can use it on an unlimited number of sites (for yourself and clients). Downsides: $59.95 for the Genesis framework and $24.95-$79.95 per child theme is on the pricey side but you can get access to everything for $249.95. Best for: Novices or advanced developers who intend to use the designs on multiple sites. *If you purchase the Genesis Theme by Studiopress, you can purchase child themes that lay on top of the Genesis framework. This makes it easy to change the look of your site whenever you want, but you still have to purchase the child themes. Upsides: Unmatched staff and community support with over 30,000 users; highly customizable with a great framework to build on; rock-solid code for search engine indexing; search engine optimization as simple as possible. Downsides: Out-of-the-box design is basic and overused; advanced customizations require HTML and CSS know-how. Best for: Graphic designers and advanced programmers who want to build a custom design on a state-of-the-art framework. Upsides: Drag-and-drop layouts and point-and-click customizations; absolutely no coding necessary; top-notch search engine optimization; plenty of tutorials and documentation to use and rework the theme. Best for: Beginners who want a brandable design without coding or hiring a designer. Upsides: Incredibly cheap, 865 themes to choose from. Downsides: Very limited support because themes are developed by individuals; almost no customization from original design; no additional search engine optimization benefits. Best for: Absolute beginners with limited budget who are testing the WordPress waters. 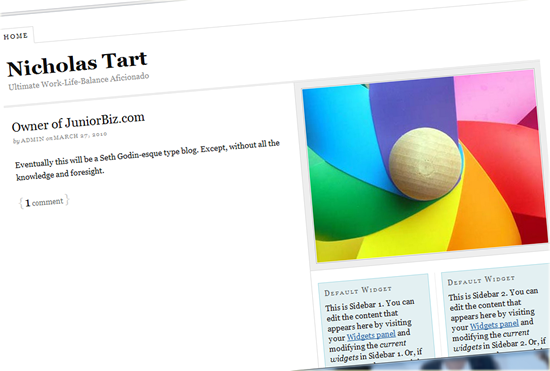 Alex Fraiser started Blogussion, one of the world’s top blogging blogs, on a basic theme. Then he found and upgraded to Thesis. He got so good at designing in Thesis that he started a company that offers Thesis skins. Check out his first skin here. Hiring a designer to create a theme that’s comparable to purchasing a premade design will cost a minimum of $1,000. You can find and qualify a WordPress designer on sites like Elance, Guru, and Freelancer. In March 2009, Michael Dunlop started IncomeDiary on a $70 WooTheme. Since, he’s spent over $30,000 making upgrades to his design. If it’s really important that your design is unique, most of the theme-providers above (ElegantThemes, Studiopress, WooThemes, and ThemeForest) offer the Photoshop files as well. It’s much easier to edit an image that already fits within a theme than to create a design from scratch. Every time Apple releases the latest iPhone, it’s a little bit different and better than the previous model. Companies are constantly, constantly refining their offerings. You need to do the same with your design. But first, let’s install it. From your dashboard, it takes seven clicks to install and activate your theme without ever having to touch a bulky FTP Client. We’ll show you how to do this here. Michael Dunlop offers a service to install WordPress and a WooTheme (among other things) for $197. Header – most themes make adding your logo to your header really simple. Content Area – fonts, font colors, font sizes, headings, subheadings, drop caps, image frames, post footers, author boxes, and comment areas are all things that are simple to customize. Some themes make it easy and others require you to edit the CSS or PHP files. Sidebar – you can utilize your sidebar by installing plugins and creating widgets (e.g. 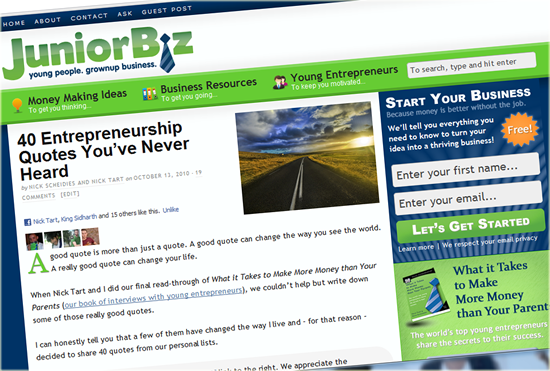 JuniorBiz uses the Popular Post Plugin to generate a list of the most viewed articles and displays it in the sidebar). Footer – your footer will show up on every page of your website so it’s very valuable space. Some themes let you customize it with widgets. Good things to put in your footer are links to your valuable content, categories, testimonials, and a very short bio that links to your about page. One of the best ways to customize your theme is to find other people who are using your theme and figure out how they customized it. In Google Chrome, you can use the Developer Tools (Wrench -> Tools -> Developer Tools) to see the HTML and CSS behind their design. Look and learn but don’t touch. Once you purchase your theme, save it on your computer. From your dashboard, click on the Appearance tab > Themes > Install Themes > Upload > Choose File > Open your file and Install Now. Install the theme just as you downloaded it. You don’t have to unzip. Go back to your Appearance tab and click Themes. Find your new theme and activate it by clicking Activate. Go to your homepage to see how it looks! P.S. This page is just one bite of a complete guide to making an awesome website. Hungry for more? You’ve got a design on your website but, next time, we’ll show you how to customize your WordPress settings to get the most out of your site. In the meantime, you can learn more and sign-up for the full-course meal here. P.P.S. If you got this course for free, we ask that you “Like” it, “Tweet” it and otherwise share it with as many people as possible. You can do that below. Thanks!